One good thing about the classics is they don't take up much space. - Which game do you love but find impossible to recommend? - Would you watch an in-game concert? Maybe you've got a favorite game from the olden days you never get rid of. Maybe you're a scrupulous uninstaller and you don't have anything from before 2013 on your pristine PC. Maybe you've got something from the 1990s taking up several whole megabytes you completely forgot about. One of the consequences of having our game libraries spread over multiple launchers is that it's become easy to forget what games we own, let alone which ones are sitting on our SSDs. Which brings us to this week's edition of the PCG Q&A: What's the oldest game you currently have installed on your PC? Have a look and then let us know in the comments. Take the time to say a little about why it's there too—it's always nice to hear about what makes an older game matter to someone. I'm very diligent about removing games off of my PC that I haven't played in a week or two because I just hate having that clutter and it makes me feel compelled to play things that I'm not necessarily enjoying just for the sake of it. That said, last Saturday I did something very stupid and installed League of Legends, which first launched in 2009, making it the oldest game on my PC currently. I feel very foolish for deciding now was the time to sacrifice my soul to the bottomless, gaping maw that is League of Legends but I'm actually having a lot of fun with it. It's not nearly as toxic as people would have you believe—at least when starting out because everyone is terrible—and though the graphics are outdated there's an undeniable charm to it. But even if the game itself is about to celebrate its tenth birthday, it still feels very modern and fun to play. I honestly don't know what I'm saying or why I'm saying it. I've been taken hostage. Send help. Like Steven, I'm pretty diligent about uninstalling games once I'm done with them—a habit I picked up when my PC's only drive was its 250GB boot SSD, as I skimped on extra storage to save money on the build. As such, I figured the oldest game would be something like Stardew Valley, or maybe X-COM, but actually it's something much older. It's not on my primary gaming desktop, but my living room PC has Dr. Robotnik's Mean Bean Machine installed. My girlfriend played it a ton with her sister when they were growing up, so I tracked it down via SEGA Mega Drive Classics and now she can play it anytime. Every so often we'll fire it up and have a showdown of not-quite-Tetris (Wes has informed me that Mean Bean Machine is a version of Puyo Puyo, and there's a new Puyo Puyo Tetris crossover game out, but we haven't made the transition yet). What dark night of the soul led to me buying the re-release of Turok? And why have I played it for exactly 60 minutes? These are both actions that I cannot justify to you, reader. I remember only having the demo for Turok on PC back in the day, so I guess this was my way of reconnecting with my younger self who couldn't afford as many games. I know Turok has its fans and this is quite a nice version of an ancient game, but damn, it's not much fun to play these days. A better and slightly more recent game on my PC right now is Grim Fandango's remaster—that's another one I couldn't afford back in the day, which I'm grateful to have the chance to check out thanks to modern digital distribution. I have too many PCs that are used for testing, but on my main testbed the oldest games are from 2015—GTA 5, Fallout 4, The Witcher 3. 2015 was a good year. The PC that my kids use does a bit better, with several Lego games including 2008's Lego Batman. But if we're counting remasters, I might just win the pot on this one. I've got The Bard's Tale Trilogy remaster installed. The first of the three games, Tales of the Unknown, originally launched in 1985. I played it on a C-64 back in the day, and I seem to recall swapping discs at some point. I definitely remember loading delays of 10 seconds or more every time you entered a building. Or at least it seemed that way to 12-year-old me. The combination of a modern PC running the remastered game off an SSD, plus a bit of help from the internet, allowed me to cruise through a game that sucked up many months of my youth in about 25 hours. And no, I refuse to play the legacy mode. Technically, it's World of Warcraft, but I don't even have a subscription now. I should probably think about uninstalling it. I've been playing that since I was in university, since Vanilla, though that version of the game only exists in Classic and private servers. As for games I'm actually still playing, it's another MMO. I'm hooked on Star Trek again, so that means I'm back on Star Trek Online, debating Romulans and dressing up my officers for hours. I don't really think of it as an old game, but it has been around for nine years. In an attempt to not be overwhelmed by choice, I've been pretty picky about the stuff I leave installed on my new PC. Most of the games I've got on the go are from 2013 or later. I also uninstall games I haven't played in a long time or games I don't intend to return to again—but I can't bear to get rid of The Sims 3 and all its expansions. Even though I haven't touched The Sims 3 since The Sims 4 came out, there's just too much history for me to delete every single bit of game data. There's my 1920s prohibition family living the mafia life by making nectar in their basement. (I named the dad after my great-grandfather because he used to make bathtub wine and sell it on the black market during the same era. No joke.) There's my dysfunctional rich family who make their kids live in a separate, detached part of the house so only the butler, nanny, and maid interact with them. There's my single chick who lives with nine cats and works as an elementary school teacher. There's my late 1800s farm family whose kids don't get to go to school because they pick vegetables and herbs all day long, but one of the middle kids ends up defecting to move to the city and pursue a career as an actor and then gets excommunicated from his family. The Sims 3 was some good times. And I do miss the cars and garages. It's mainly laziness—Eye of the Beholder 2, the D&D dungeon crawler from 1991, isn't taking up much space, so it's easier to let it sit there than to go to the couple-of-clicks hassle of removing it. But I like having it installed, too, this game I loved so much, from so long ago, that somehow still runs just like it did a quarter-century back. And I'll probably jump back into it someday, if only to prove to myself that I've still got the stones to get out of that goddamn impossible Drow dungeon. Even after all this time, it's still one of the best dungeon crawlers you can get your hands on, and I do love crawling through dungeons. I thought the oldest game on my PC was going to be Command & Conquer. A few years ago I found my discs for Red Alert 2 and Yuri's Revenge and made a point of ripping and installing them—because you never know when you're going to want to play Red Alert 2 again. RA2 doesn't quite get me past the 20 year mark, but October 2000 still feels like a lifetime ago, at this point. 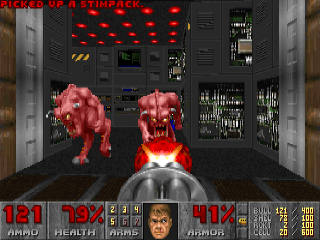 The actual oldest game I have installed, apparently, is 1995's Ultimate Doom. Considering this digital version was released on Steam in 2007, though, maybe Red Alert 2 is still the winner. Hell, they're both great classic games, and take up little space on a modern PC. I remember RA2 taking up something like 25% of my entire hard drive back when I first got it. Now it's so insignificant I can easily forget I've had it installed for years. I installed Playnite recently to organize my games better. One of its advantages is that it pulled all the Atari 2600 games I emulate into its library, and another is that it can sort by date, which is the only reason I've realized I have a game that's older than me on my PC. Outlaw was a western shootout with charmingly huge pixel cowboys, and I can still remember playing it against my uncle over 30 years ago.